A wine with wonderful color and structure. 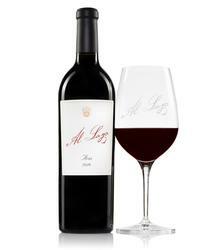 The ultra-intense aromas include crushed blackberries, peppercorns, black currants. The refreshing acidity found in the wine cuts through the rich aromas and creates a fresh texture. The 2014 Aria is an interesting mix of mostly Syrah with 5% Sangiovese, all of which spent 16 months in 30% new oak. Giving up plenty of jammy blackberries, crushed violets, creamy licorice and a hint of graphite, it's ripe, layered and beautifully concentrated on the palate, while staying fresh, lively and elegant. Drink it over the coming decade. Glass-staining purple. Smoky, oak-spiced blackberry, licorice pastille and a hint of olive on the nose, complicated by suave floral and mineral overtones. Velvety, sweet and concentrated, offering black and blue fruit liquor and spice cake flavors that slowly tighten up in the air. Dusty tannins come in late, giving shape to a very ;png, smoke-and-spice-tinged finish.